This Client Side add-on to Thaumcraft allows you to automatically keep track of nodes you have scanned with the Thaumometer. If you have already scanned the node, it will update the list with any changes in the node. 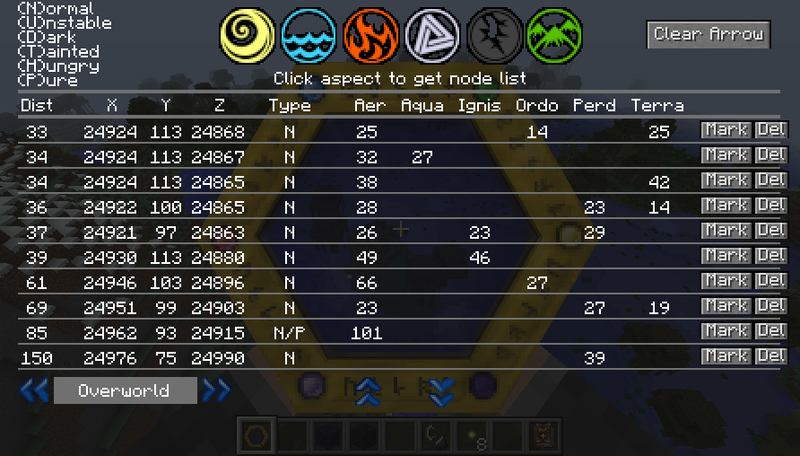 An in game list allows you to see nodes you have scanned and sorts them by Aspect (Primal Only) and distance from player. If you are wearing the Goggles of Revealing you can also select the node and get an in game arrow pointing you in the nodes direction. Could we get this updated to 1.12.2?? what versions does this work on? Does the goggles of revealing arrow work with the sanguine helmet or a bound helmet with a sanguine helmet added into it, the manasteel/terrasteel/elementium helmets of revealing or other forms of "upgraded" goggles of revealing? As long as they extend thaumcraft goggles of revealing in the code, it should work. I just wanted to stop by and say that this mod is fantastic, and I love you. This is so much better than cluttering up my mini-map with dozens of nodes. Re: special node marking: JourneyMap integration, perhaps? If a user want a note on specific node, create a waypoint for it at the node coords? is it perhaps possible to note down special nodes? for example if you scan a node from an eldritch obelisk it'd mention it in the list, or if you've scanned the node from a thaumium hill or altar, or perhaps a node inside a desert temple? That would be tough to do if not impossible. I run a Thaumcraft 4.2.3.5 server that holds up to 50 people if anyone wants to play with us. I love this mod! It is SO use full, keep up the great work! Wow, I like this mod so far. Neat idea.